This is the smallest in the range of Hopalong Cassidy bicycles made by Rollfast in the early 1950s. It is suitable for a young girl around the ages of eight to ten. The smallest item in the series is the ‘Hoppy’ tricycle, whose front wheel is 16″. Their handlebars are around the same height, but this bicycle has 20″ wheels with balloon tyres and it is proportionally about 50% larger than the tricycle. Parts of the bicycle – such as the tank and wheels – have been repainted, with other parts retaining their original patina. I also have a pistol and holster set for it (not shown). Rollfast bicycles have a long and complex history with ties between two different company. The D.P. Harris Hardware and Manufacturing Company originated the name in the 1890s. In the early 1900s they teamed up with the H.P. Snyder Manufacturing Company. Snyder was the primary manufacturer of the bicycles, while Harris provided some of the parts and marketed them. During the Great Depression, Snyder began manufacturing bicycles for other retailers such as Montgomery Ward who sold them under the Hawthorne name. Two particularly collectible Snyder-built Rollfast bicycles are the V-200 model and the Hopalong Cassidy bicycles. 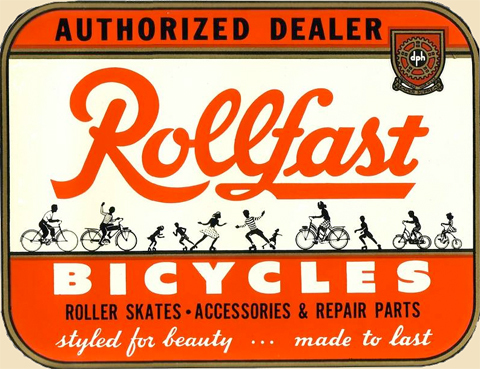 Snyder built Rollfast bicycles well into the 1970’s. During 1950, cowboy themed merchandise was popular. Harris used a tie-in with Hopalong Cassidy to take advantage of this fascination. The bikes came in black with white and chrome trim. There were a pair of built-in pistols with jeweled holsters, horse hair grained saddle, fringed rear carrier, “Hopalong Cassidy” medallions on the tank, chrome studs on the Rocket Ray light, chain guard and fenders and a head badge in the shape of an upside down horse shoe. The first models – described below as ‘Juvenile Models’ – had 20″ and 24″ wheels. In response to an avalanche of requests from teen-agers and parents, ROLLFAST is now producing FULL SIZE 26″ HOPALONG CASSIDY Bicycles. The surge of popularity of America’s rugged Man-of-the-Year has definitely engulfed the 10 to 16 youth group. ROLLFAST and HOPALONG join to score another FIRST that will put a double-barrelled ‘hop’ into your fall sales! 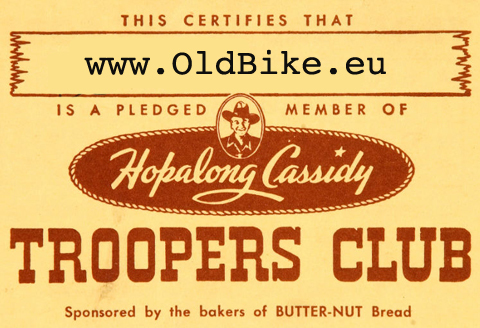 The new, full size HOPALONG CASSIDY bicycles possess all the smart, exclusive features essential to successful TOP models … spring forks, whitewall tyres, character styled lamps, tanks, chain guards, carriers … all with a touch of the Old West to produce the nation’s MOST WANTED BICYCLE! Write, wire or telephone today for details and Fair Trade prices. The most dynamic advertising and publicity promotion ever conceived reaches yiour customers wherever they are, in cities … towns … villages …! ‘Hoppy’ comic strips to more than 11,000,000 paid circulation daily … 60 television stations, 450 radio stations, and thousands of movie theaters produce ‘Hoppy’ shows … 100,000,000 readers of LIFE, LOOK, McCALLS and READERS DIGEST have read and seen ‘Hoppy’ feature editorials during the past month. Untold thousands of youngsters continue to stampede the Western star’s ‘personal appearance’ Circus as it rolls from city to city. Tie in with this powerful, all-out campaign that shoots straight at extra sales for you. 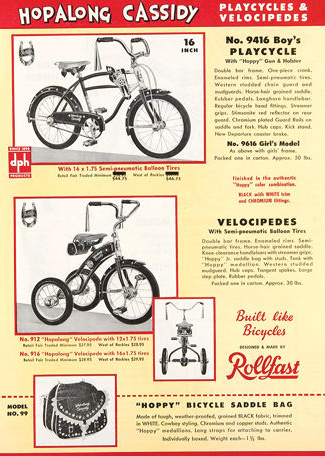 You really can’t afford to overlook the potential of ROLLFAST’S HOPALONG CASSIDY BICYCLES, VELOCIPEDES, PLAYCYCLES & SKATES. D.P. Harris Hdw & Mfg Company Inc. 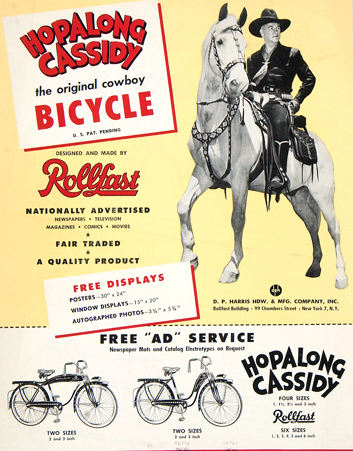 The Hopalong Cassidy Boy’s bicycle with 24″ wheels was aimed at older teenagers and was the original Cowboy Model. 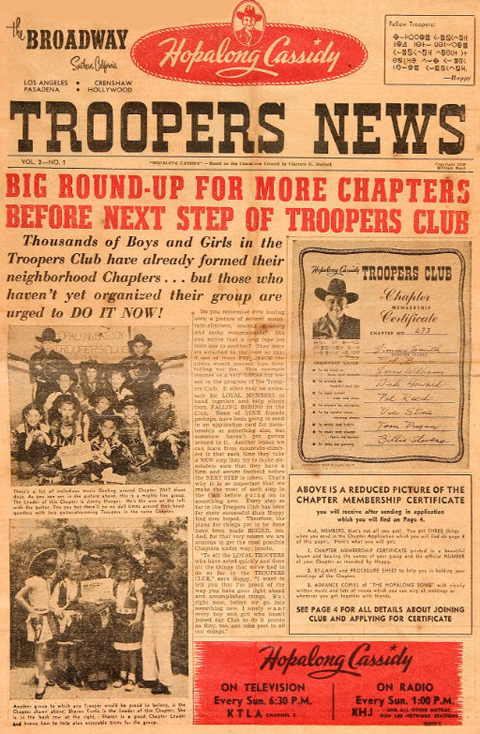 It came with a Hopalong Cassidy holster set mounted on the tank with matching pistols; ‘long-horn’ handlebars that ‘look like real steers horns’ with streamers on the grips; studded fenders (mudguards); a tank with medallions; a fringe around the rear carrier; and chrome hubcaps. After the success of the 20″ and 24″ Cowboy bicycle models introduced in the spring of 1950, the company also produced a 26″ wheel adult size model, which did not feature the pistol and holster set, as well as a children’s 16″ model and velocipede tricycle. These days, it may be hard to imagine teenagers wanting to ride a themed ‘character bike.’ But in the early fifties this idea was extremely popular, and the Hopalong Cassidy 24″ Boy’s Cowboy Model, made by the well-known and reputable Rollfast company, was the most successful bicycle of its kind. 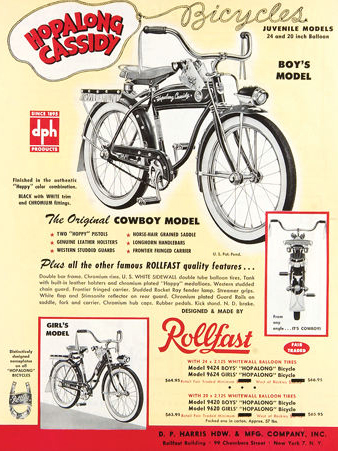 Such was its success that in the sixties manufacturers studied Rollfast’s Hopalong Cassidy publicity campaign and copied the idea of a bicycle with distinct style for teenagers to launch bikes such as the Chopper and the BMX. 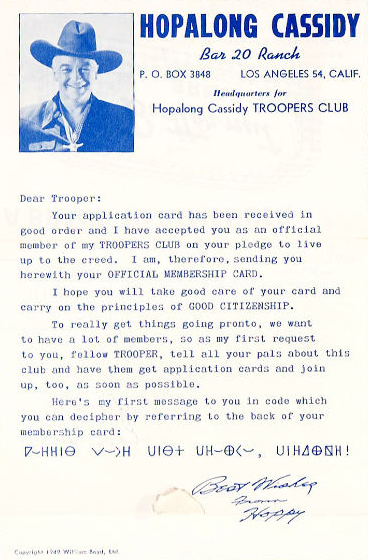 As you can see, I’ve pledged to live up to the creed, and my membership card has recently arrived. Hoppy told me to tell all my pals about the club so you can all get application cards and join up too, as soon as possible. I am now studying the Troopers Secret Code so that I can communicate with other boys and girls when I see them out on their Hoppy bikes. 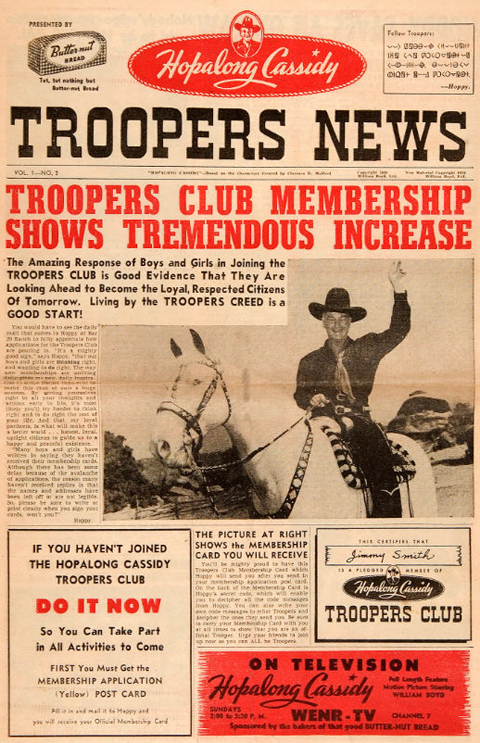 As well as badge, secret code chart and membership card, subscribers to Hopalong Cassidy’s Troopers Club also received the Troopers News.